If you found this post useful, I would really love it, if you pin it or share it with your Facebook fans or Twitter followers or Google+ circles today. All it takes is a simple click on the “pin it” “like,” “share,” “tweet,” or Google+ buttons below the post. Thanks you! Great, padhu. 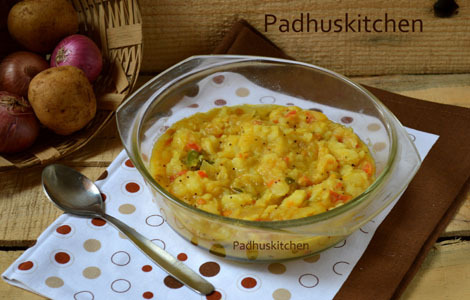 I tried your potato side dish for poori and it turned out perfect. Earlier I used to add aloo and then water so, the subji turned messy and thick. My husband always complained about this. First time it turned out well after your post.thank you. Your posts are very useful for me and I have learnt the nuances. Great padhu. Thanks a lot.i have tried earlier this side dish but it turned out messy and thick. After reading your post understood that water has to be added first and then aloo. Your regular posts are useful for me and I have learnt the nuances, which makes a great difference. I tried it.it was jst supr padhu.thank u.. I made this dish sticking strictly to your recipe and it turned out yummy! Thanks for posting this recipe!!! Just prepared and it came out very well. I really appreciate your hard work in helping us to prepare delicious food at home. Thank you for that. I tried your recipe and it came out very well.. I tried this. Loved it!